I haven’t been able to sleep without earplugs since I was 18. If, by accident, one of them drops out when I’m about to fall asleep, I suddenly panic and fumble everywhere until I find it, place it back inside my ear, and block off the world outside. Earplugs changed my life. When I was fifteen, my dad had another child. We didn’t live together – my parents were divorced, I stayed with my mother in Strasbourg, and went to see my father in Paris every other week-end. I shared a room with that little boy when I went – and he woke up screaming every night, three, four, five, six times. I was a teenager then, and the stress of a fortnightly plane commute, clashing value systems between my parents, competitive schools, and now the dreaded screams of a baby, made me develop serious insomnia. I became hyper-sensitive to noises in the night – and even when I got back to a room of my own, started spending long sterile hours awake, anticipating the sudden moment when silence would be torn apart. Then I started dating Aurelie – and her mother wore earplugs every night. Until then, I’d only seen earplugs in comics, and I only half believed in their existence. There was something ridiculous and shameful about them. But if my girlfriend’s mother used them, maybe I could. She gave me the first box – and I was hooked. At last, I was physically protected from nightly sonic invasion, and my body was able to relax. In France, I bought earplugs, or boules quiès, at the pharmacy. They came in a rectangular white box of eight, packed in two rows of four, little balls of hard pink wax covered in white cotton. The brand is not available in Australia, but I’ve happily shifted my preference to pink silicon earplugs. 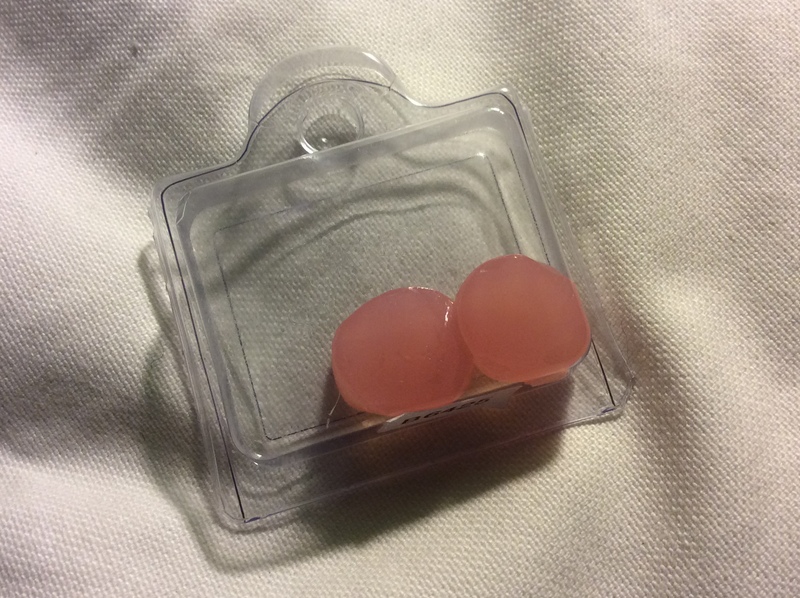 These come in small rectangular packs of transparent plastic, with a semi-circular flap on one of the long sides, and an attached lid which opens vertically. Each pack contains two rows of three small cylinders made of pink sillicon, about one centimeter tall. Fresh earplugs are slightly sticky, and highly malleable. The trick is to press them in your fingers, elongate them slight, and place them on top of the ear canal – without pushing in too much. They not only considerably considerably reduce outside noises, but also provide the same feeling of comfort and security as a well-wrapped doona: a soft presence inside your ear, protecting you from nightly shadows and fears. You can use a pair for one or two weeks, but they get dirty with time, lose their stickiness, and fall off more and more frequently. I buy my earplugs at the pharmacy for about 10$ a box. It’s a $120 budget for the year, or about 30 cents a day. These earplugs are essential to my sleep, and I’m about as addicted to them as I am to morning espresso. When I went to China for six months, I carried six boxes with me – and the sheer thought of even one night without earplugs causes me waves of anxiety. But they’re easy to procure, and as far as I know, quite innocuous – so for the foreseeable future, I will indulge happily, and keep a steady supply of earplugs in my bedroom.